Before Truece, parents had limited options for keeping good records for their divorce and custody arrangements. Our app provides advanced tools that have been engineered to support the specific needs and legal requirements of separated and divorced parents and their attorneys. Call a Truece in your divorce. Truece is currently in Beta. Sign up to get release updates! Saving screenshots of arguments or important discussions is a thing of the past. Truece time stamps and permanently saves conversations. 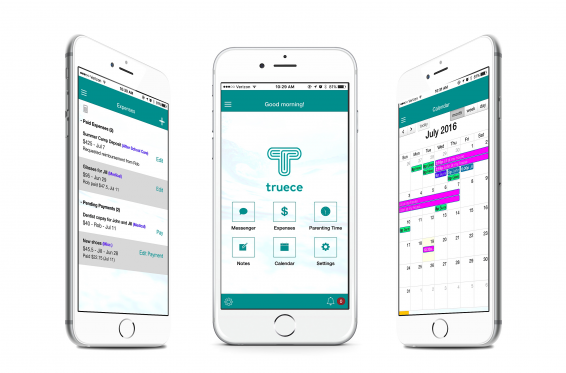 Truece let’s you set geo-fenced triggers to automatically track parenting time so you’ll never have to guess again. Request reimbursements and track who paid what and when. Getting “nickel-and-dimed” stops here. Share important info, notes and photos without ever interacting with your ex. Studies show that a low conflict divorce is one of the most important factors in helping kids cope with their parents separation. When messages are saved you can hold your ex accountable and conflict is greatly reduced. The structured communication, collaboration and record keeping our app provides will help you keep your kids out of the middle, and prevent stressful interactions with your ex. Share Truece with a parent who needs it!